(AP) JOHANNESBURG - People slowly came outside despite the cold wind Tuesday across South Africa, pointed their mobile phone cameras to the sky and opened their mouths to taste a rare snowfall that fell on much of the country. The snow began Tuesday morning, part of an extreme cold snap now biting into a nation still in its winter months. By mid-afternoon, officials recorded snowfall across every South African province except Limpopo, though a formal report from the region had yet to reach the South African Weather Service, agency spokeswoman Kenosi Machepa said. Satellite imagery suggested the snow reached there as well, she said. The snow closed some roads and at least one high-altitude pass. 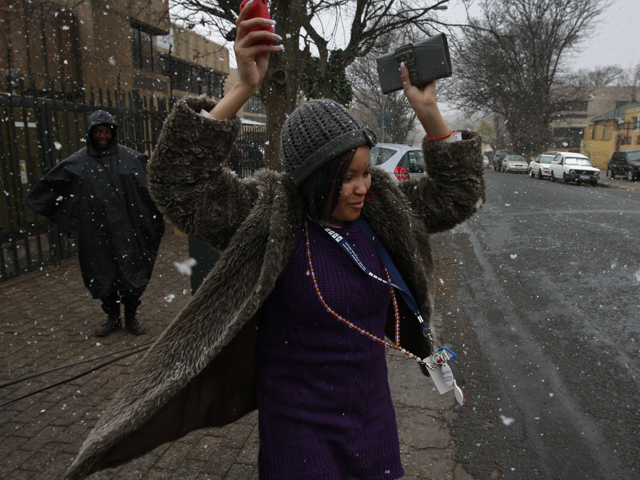 As the snow fell, workers at offices in Johannesburg rushed outside. Some twirled and danced as the flakes fell. One man rushed to the top of a snow-covered hill and slid down, using a cardboard box as an improvised toboggan. Despite the cold and the snow, beggars who line traffic lights in the city continued to ask passing motorists for cash. The snow grew heavier in the afternoon in Johannesburg, covering rooftops and slicking roads. Snowflakes are a rare commodity in Johannesburg, even during winter. South African Weather Service records show it has snowed in Johannesburg on only 22 other days in the last 103 years. The last snow fell there in June 2007. In Pretoria, the country's capital, flurries filled the sky during a visit by U.S. Secretary of State Hillary Rodham Clinton. It was the first snowfall there since 1968, the weather service said. The cold weather is expected to last a few days.